27 holes, par 72, 7225 yards. All prices per person and include golf cart rental. Designed by Arnold Palmer and Ed Seay, this unique course boasts 27 dramatic holes - the only golf course of its kind in Hawaii. It occupies 270 acres of sheer beauty and offers stunning views of the rain-carved Waianae mountains. Hawaii Prince Golf Club is one of the stops on The Golf Channel Amateur Tour. 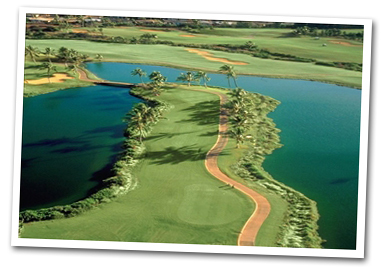 Hawaii Prince has three nine hole courses that are played in three eighteen hole combinations. The course layout consists of three nine-hole courses any two of which can be combined to play 18. (A&B,B&C,A&C). The longest yardage combination would be (B&C) measuring 7,255 from the back tees. This course is located on former sugar land. There are 270 acres of stunning views of the rain-carved Waianae Mountains. Ten scenic lakes protect many of the well-manicured greens. The club hosts several celebrity tournaments and the Super Pro Am. These courses are suited for both the beginner and above average golfer. The Hawaii Prince Golf Academy is located on the premises.